Risk perception and decision-making: do farmers consider risks from climate change? Small-scale farmers are highly threatened by climate change. Experts often base their interventions to support farmers to adapt to climate change on their own perception of farmers’ livelihood risks. However, if differences in risk perception between farmers and experts exist, these interventions might fail. Thus, for effective design and implementation of adaptation strategies for farmers, it is necessary to understand farmers’ perception and how it influences their decision-making. We analyze farmers’ and experts’ systemic view on climate change threats in relation to other agricultural livelihood risks and assess the differences between their perceptions. For Cauca, Colombia, we found that experts and farmers perceived climate-related and other livelihood risks differently. While farmers’ perceived risks were a failure in crop production and lack of access to health and educational services, experts, in contrast, perceived insecurity and the unreliable weather to be the highest risks for farmers. On barriers that prevent farmers from taking action against risks, experts perceived both external factors such as the national policy and internal factors such as the adaptive capacity of farmers to be the main barriers. Farmers ranked the lack of information, especially about weather and climate, as their main barrier to adapt. Effective policies aiming at climate change adaptation need to relate climate change risks to other production risks as farmers often perceive climate change in the context of other risks. Policymakers in climate change need to consider differences in risk perception. The online version of this article ( https://doi.org/10.1007/s10584-018-2320-1) contains supplementary material, which is available to authorized users. Climate change poses major challenges to our society, especially in the agricultural sector in developing countries (Vermeulen et al. 2011). Experts have argued that adaptation and mitigation actions are urgently needed to pave climate-resilient pathways for the future (IPCC 2014a). One major challenge with the design and implementation of adequate actions is the complexity of the systems characterized by interactions between environmental and human dynamics at different scales (Turner et al. 2003). Delayed and unexpected feedback loops, nonlinearities, and abrupt rather than gradual changes render the climate system exceedingly hard to predict and the reactions of the exposed human system even less foreseeable (Alley et al. 2003). These entailed uncertainties make decision- and policymaking a difficult task. The difficulties in climate-relevant decision- and policymaking in agriculture are further aggravated by differing perceptions of climate change by experts and farmers. Despite the scientific consensus about existence, risks, and possible solutions to climate change, nonspecialists largely seem to underestimate and misinterpret these causes and risks (Ding et al. 2011). This is partly due to two key facts: first, most people do not differentiate between weather and climate (Weber 2010) and are thereby unable to distinguish climate variability from climate change (Finnis et al. 2015). Second, most people still perceive the likelihood that climate change might affect them directly as low (Weber 2010; Barnes and Toma 2011; Lee et al. 2015). When taking decisions towards adaptation, people tend to relate possible actions to probable consequences in a linear manner without considering feedback loops, delays, and nonlinearities (Weber 2006). The success of agricultural climate policies relies to a large extent on farmers’ awareness of climate change including their knowledge and beliefs regarding climate change and how it will affect them (Patt and Schröter 2008; Carlton et al. 2016). Scholars have found that small-scale farmers in Latin America are highly vulnerable to climate change (Baca et al. 2014; Eitzinger et al. 2014). While farmers have adapted continuously to social and environmental change in the past, the magnitude of climate change strikes the already stressed rural population. In Latin America, inequality and economic vulnerability call for an approach that tackles the underlying causes of vulnerability before implementing adaptation strategies (Eakin and Lemos 2010). Without visualizing climate change as one of the multiple exposures, small-scale farmers rarely adapt their farming practices even if suggested by climate policies (Niles et al. 2015). This reluctance is greatly influenced by the farmers’ beliefs and perception concerning causes and local impacts of climate change (Haden et al. 2012). Furthermore, adaptive actions are driven by individuals and groups ideally supported by institutions and governmental organizations. In many countries in Latin America, the influence of governments has become weaker due to economic liberalization. Thus, governance mechanisms have lost their capacity to manage risks and to address issues of social vulnerability, especially in rural areas (Eakin and Lemos 2006). “By 2050, climate change in Colombia will likely impact 3.5 million people” (Ramirez-Villegas et al. 2012, p. 1), and scenarios of impacts from long-term climate change will likely threaten socioeconomics of Colombian agriculture. In Colombia’s southwestern department Cauca, the average increase in annual temperature to the 2050s is estimated to be 2.1 °C with a minor increase in precipitation (Ramirez-Villegas et al. 2012). In this region, coffee farmers face several challenges through climate change, like shifting suitable areas into higher altitudes, implying reduced yields and increasing pest and disease pressure (Ovalle-Rivera et al. 2015). Ovalle-Rivera et al. (2015) estimate a national average of 16% decrease of climate suitability for coffee in Colombia by 2050, mostly for areas below 1800 m a.s.l. During the twentieth century, Colombia’s agrarian reform was the best example of failed top-down approaches to promote self-reliant grassroots organizations in agriculture (Gutiérrez 2014), which might be more likely to adapt to climate change. Vulnerabilities in Colombia are structural and need to be addressed through transformative adaptation (Feola 2013). First, rural populations in Colombia, and especially resource-limited farmers, depend on natural resources and are particularly sensitive to environmental stress. Second, the level of human security is low and tied to deeply rooted socioeconomic and political inequality. Third, the institutional setting is a mix of formal and informal institutions that facilitate or impede building adaptive capacity of farmers (Eakin and Lemos 2010; Feola 2013). For the successful adaptation of Colombian agriculture to agricultural risks from climate, the government should set up enabling policies and release funds for research and development to subsectors (Ramirez-Villegas and Khoury 2013). Adaptation options should be developed based on underlying vulnerability analysis and participatory processes with farmers and experts (Feola 2013). The interaction between grassroots organizations (bottom-up) and institutions (top-down) is crucial for transformative adaptation (Bizikova et al. 2012). 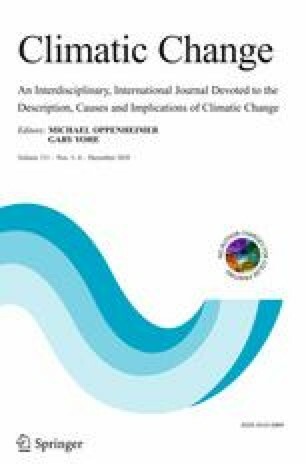 The development of adaptation options is hampered by the fact that experts often have an incomplete view of farmers’ perceptions which might have vast implications for effective risk communication, e.g., regarding climate change, and during the participatory design process of adaptation strategies (Thomas et al. 2015). These findings imply that an improved, in-depth understanding of the differences in risk perception between farmers and experts is necessary for the design of more effective and successful policies to promote adaptation initiatives. To gauge the prevailing perception of various groups, mental models (MMs) have been successfully employed in the past, for example, to elicit farmers’ perceptions and underlying views on livelihood risks (Schoell and Binder 2009; Binder and Schöll 2010; Jones et al. 2011). MMs provide insight into perceptions and priority setting of individuals (Morgan et al. 2002) and can help to understand risk perceptions and to inform the design of effective risk communication strategies. In risk analysis, MMs have been used to identify how individuals construct representations of risk (Atman et al. 1994; Schöll and Binder 2010; Binder and Schöll 2010). Based on the mental model approach (MMA) (Morgan et al. 2002), Binder and Schöll (2010) developed the structured mental model approach (SMMA). The SMMA combines the so-called sustainable livelihood framework (SLF) (Scoones 1998)—a framework that shows how sustainable livelihoods are achieved through access to resources of livelihood capitals with the MMA (Morgan et al. 2002). The SMMA can help to understand how farmers perceive and balance livelihood risks for their agricultural practices (Schoell and Binder 2009; Binder and Schöll 2010). This study aims (i) to understand how climate risks are integrated in the context of other risks in the farmers’ perception and decision-making process for taking action, (ii) to identify differences between farmers’ and experts’ mental models regarding farmers’ agricultural risk perception, and (iii) to elaborate on possible consequences for policies addressing farmers’ livelihood risks and their agricultural adaptation strategies in the face of climate change. The paper is structured as follows: first, we present material and methods on how we analyze climate risks in the context of farmers’ livelihood risks and analyze differences in perception between farmers’ and experts’ MMs. Second, we present results from applying our approach to the Cauca Department in Colombia (South America) as an exemplary study for a region for small-scale farmers in a developing country. Finally, we discuss our findings concerning other literature and draw our conclusions. The Cauca Department is located in the southwestern part of Colombia with a size of approximately 30,000 km2. Cauca is composed of a lowland coastal region, two Cordilleras of the Andes, and an inner Andean valley. Agricultural land is concentrated in the inner Andean valley. According to the latest agricultural census (DANE 2014), 83% of the farmers in Cauca have a low educational achievement (elementary school only), 22% are illiterate, and 52% live in poverty according to Colombia’s Multidimensional Poverty Index (Salazar et al. 2011). The main stressors for agriculture and farmers alongside climate change are trade liberalization and violent conflicts (Feola et al. 2015). Colombia has one of the longest ongoing civil conflicts and one of the highest rates of internal displacement, estimated to be 7% of the country’s population and 29% of the rural population (Ibáñez and Vélez 2008). Cauca is one of the regions in Colombia with a high rate of violence from armed conflicts (Holmes et al. 2006). Especially for small farm households, weak institutional support and absence of the state in rural areas have led to unequal land distribution and lacking technical assistance as well as financial services for agricultural transformation (Pérez Correa and Pérez Martínez 2002). Due to Cauca’s proximity to the Pacific Ocean, the region is subject to inter-annual climate variability mainly driven by the El Niño Southern Oscillation (ENSO) (Poveda et al. 2001), a feature that has great influence on agricultural productivity and, in consequence, farmers’ livelihood. A study by the CGIAR Research Program on Climate Change, Agriculture and Food Security (CCAFS) shows that farmers in the study area are mostly affected by more frequent droughts, storm and hail events, more erratic rains, and landslides as a consequence of heavy rains (Garlick 2016). Even if uncertainty in future scenarios of extreme events is still high, changes in inter-annual climate variability are of high relevance for farmers; there is agreement that more intense and frequent extreme events are likely to be observed in the future (IPCC 2014b). The Cauca region is particularly relevant for these types of analyses as (i) the region has a high potential of being affected by climate change, (ii) interventions for rural development by the government have been weak in the past, and (iii) because of the national and international efforts to implement the peace process, Cauca has caught attention for implementing development interventions. Many of these interventions could benefit from an in-depth understanding of farmers’ perceptions regarding the climate and nonclimate risks affecting their livelihoods. Exemplary for Cauca, we selected a geographical domain of 10 km2 with altitudes between 1600 and 1800 m a.s.l. within the boundaries of the municipality Popayan. We conducted the interviews with experts and farmers in five rural villages and selected randomly 11 to 12 farmers each village (see details on sampling design in Chapter 2.4). The farm size of interviewees was between 1 and 4 ha, half of them (45%) possessed legal land titles, and 41% of farmers have started the legalization process recently. The average age of interviewees was 47 years old, 48% of them were women farmer, and the average household size was five people. Overall, 74% of farmers depend on coffee (Coffea arabica) as their main agricultural livelihood besides other crops and some livestock to complement income and for self-consumption. Other crops and livestock that are managed in the farming systems are cassava (Manihot esculenta), dry beans (Phaseolus vulgaris), maize (Zea mays), banana (Musa acuminata), cattle, and poultry. As the second most important crop, 19% of interviewed households depend on sugarcane (Saccharum officinarum) and the derived product panela, which is unrefined sugar in compact loaves of a rectangular shape. Most of farmers’ income is coming from on-farm agricultural activities and also from off-farm day labor activities in the agricultural sector (harvest coffee in other farms). Generally, there are few job opportunities in the study area. Before we started analyzing risk perceptions, we conducted an assessment of climate risks and impacts on main crops grown in the region and reviewed existing literature on the vulnerability of farmers in the study area. First, we compared anomalies of precipitation, maximum temperature, and minimum temperature in the study area with records about ENSO events. 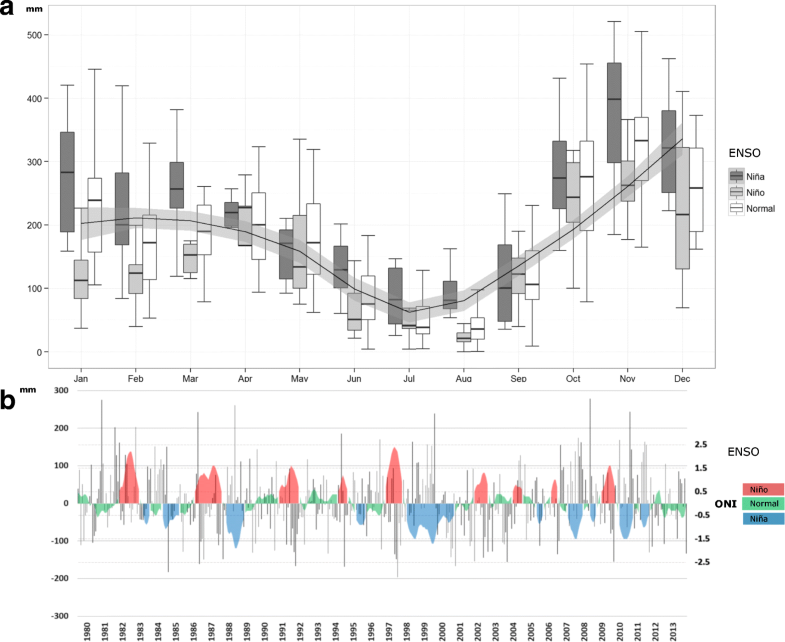 We used data of a local weather station from the Instituto de Hidrologia, Meteorologia y Estudios Ambientales de Colombia (IDEAM) and data of the Oceanic Niño Index (ONI) from the National Oceanic and Atmospheric Administration (NOAA) (NOAA 2014). Second, we used a simple climate envelope model to analyze the current and future climate suitability of six crops in the study area. Finally, we reviewed the existing literature on climate change impact assessment for Colombia. Detailed results of climate risk assessment in the study area are presented in Online Resource 1. Figure 1 presents the conceptual approach of the study. Farmers’ perceptions regarding climate risks are shaped by their knowledge about the causes of climate change, their beliefs, social norms, and values as well as through their experience with climate-related information and past climate-related events. However, farmers’ decision-making is not only shaped by climate risks, but other agricultural production risks are also equal or even more important for farmers. 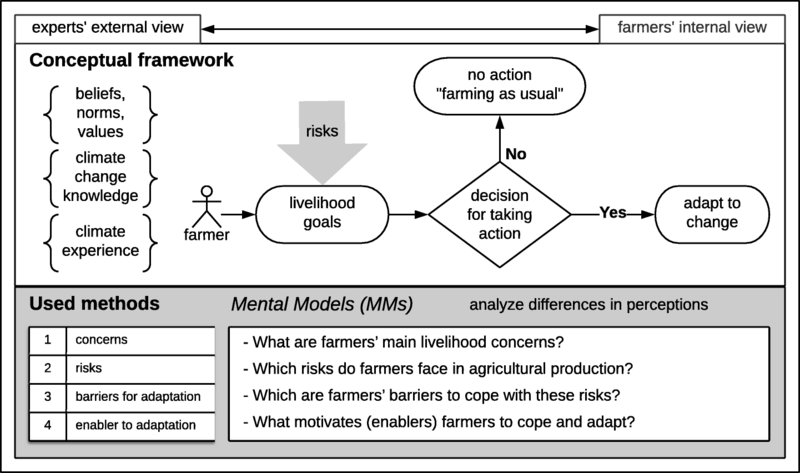 Farmers consider the complete mental model of risks when envisioning goals concerning their livelihood strategy and make appropriate decisions about investments and adaptations of the agricultural production system. In applying our approach, we captured experts’ external views of farmers’ perception and compared it to the farmers’ internal views. To assess the importance of climate risks in the context of another risk in farmers’ agricultural production system, we identified differences between the perception of farmers and that of experts regarding climate risks as placed in the context of other risks within the farmers’ livelihood system by analyzing and comparing each group’s MMs. The experts’ perspective on farmers’ perceptions represented the external view, whereas the perspective of the farmers themselves represented the internal one. We captured the external and internal views on climate risks with two sets of structured interviews with experts and farmers, and we used ranking techniques to show differences in perception. A qualitative semi-structured interview study was conducted between June and September 2014 to examine perceptions of experts and farmers about farmers’ livelihood risks and farmers’ barriers for adaptation to cope with risks they face in agricultural production. In a first step, we conducted open interviews with 13 experts. In order to obtain a holistic view of experts’ perceptions, we included regional, national, and international experts from different fields of the analyzed agro-environmental system, namely four agronomists, three economists, one environmental lawyer, one public government administrator, one nutritionist, one climate change scientist, one ecologist, and one veterinarian. All experts have been regularly working with farmers in the study region during the last 5 to 10 yrs and have still been working with them at the time of the study. Following the expert interviews, we conducted 58 semi-structured interviews with farmers from five different villages in the municipality of Popayan, performing between 10 and 12 farmer interviews from different households and for each village. The total population of farmers of the five villages was 499 at the time of the interviews. We included farmers aged 20 to 60, and we designed the sample to ensure an equal representation of women and men. Morgan et al. (2002) judge a small sample for interviews within a population group that has relatively similar beliefs as reasonable. Schoell and Binder (2009) found for the case of small farmers in Boyacá, Colombia, that after 5–10 interviews, no more new concepts emerged (Binder et al. 2015). To avoid interruption from notes taken by the interviewer and to keep the natural flow of conversation, we recorded all interviews with the consent of the participants. Subsequently, we transcribed the records of the interviews for the analysis. The used guidebook for expert interviews can be found in Online Resource 2 and the guidebook for farmer interviews in Online Resource 3. What are the farmers’ main livelihood concerns? Which risks do farmers face in agricultural production? Which are farmers’ barriers to cope with these risks? What motivates (enablers) farmers to cope and adapt? In the expert interviews, we received answers and explanations to the four guiding questions about farmers’ concerns, risks, barriers for taking action, and enablers to take action when facing risks in agricultural production. We noted all answers of experts for each question on small cards. Answers from all experts were pooled after finishing all the interviews; we got 16 concerns, 10 risks, 13 barriers for taking action, and eight enablers to take action. Based on the pooled elements, we used an online survey tool to ask the same group of experts to rank all compiled elements according to the importance of the elements for farmers. The highest ranked elements by experts were then selected to start the farmer interviews. Second, we carried out the farmers’ interviews. After explaining the overall purpose of the study briefly as part of informed consent with farmers, we visualized the elements of the experts through drawings we created for each question and then asked farmers to rank them according to their priorities. After piloting the interviews with farmers, we decided to use only the six highest ranked elements by experts to keep the ranking exercise for farmers simple. In addition, we asked farmers at the end of each ranking if they would consider other elements to be more important for them that the ones we used for the ranking (see Online Resource 3). We did not mention climate change during the interviews for a specific purpose. Farmers should rank the card elements without being biased by knowing the purpose of the interview, namely to understand how they perceive climate risks in relation to other livelihood risks. where w is the weight, x the response count of an answer choice of each question, and n the total number of answer elements. In our case of six elements per question, we calculated the average ranking using weights starting at 6 for the highest ranked element and decreasing towards 1 for the lowest ranked element. We compared the average experts’ rankings to farmers’ rankings stratified by gender and age group and then applied the hierarchical clustering approach (Ward 1963) to the farmers’ rankings to obtain groups of farmers with similar choices. The hierarchical clustering approach by Ward (1963) is a widely used data analysis approach for similarity grouping to determine distinct subgroups with similar characteristics (Vigneau and Qannari 2003). After obtaining groups of farmers from clusters, we described them based on high ranks using first and second ranked answers each question and demographic variables collected during the surveys. Figure 2 shows that inter-annual rainfall variability is high. High variability in rainfall can be observed between October and February for long-term weather records since 1980. Inter-annual climate variations in the study area are mainly driven by the ENSO. The consequences of ENSO for farmers and agricultural production are prolonged droughts (El Niño) or intense rainfall over more extended periods (La Niña). The assessment of the six most relevant crops in the study area revealed that variation in crop exposure to climate variability in Cauca is high (see Online Resource 1). Farm households in the study area grow coffee, sugarcane, maize, dry beans, banana, and cassava. While banana, sugarcane, and cassava can better cope with long-term climate change scenarios, dry beans and coffee are more likely affected by increasing mean annual temperatures. Production of coffee and dry beans represents an important livelihood for farmers in the study region but will likely face impacts through climate change in the future. See Online Resource 1 for more details on climate change risks in the study area. We found that experts and farmers perceived farmers’ livelihood concerns and enablers for adaptation to agricultural production risks similarly, but risks and barriers for adaptation differently (see Fig. 3). Also, farmers agreed on the selected answers as the most relevant for them for each question; only a few farmers mentioned other elements. Beyond, the most mentioned elements by farmers were concerns about health (five times) and access to tap water (three times). Older farmers are more worried about climate change than younger farmers but rank production failure low as risk (see Fig. 4). Interestingly, older farmers saw insecure transport as a major risk and production failure as a lower risk, whereas this was the opposite for younger farmers. Regarding farmers’ concerns (Fig. 3a), we found two issues experts and farmers agreed upon: poverty is a chief concern in this region (ranked first by experts and second by farmers) and neither climate change nor security problems are perceived to be relevant in the study area. The key differences in perceived concerns were related to government policies, access to credit, and market opportunities. Farmers were highly worried regarding government policies (rank 1). They argued: “The government in the capital, Bogota, is too far away and does not take into account the context of our region when making new laws” (farmer’s interview, translated from Spanish, Colombia, October 2014). Experts ranked government policies lower with respect to concerns (rank 3), but they agreed in their explanations with farmers that: “The government is focusing on international trade agreements and is supporting medium-sized and large farmers, they are not investing in small-scale farmers’ production” (expert’s interview, translated from Spanish, Colombia, August 2014). Both male and female farmers were highly worried regarding their access to credit to be able to pay for labor and to purchase inputs for crop production (rank 3). Experts, on the other hand, did not perceive that farmers need to be worried about having access to credit (rank 6). In contrast, experts believed that farmers were worried about market opportunities—a perception shared more often by women than by men (see Fig. 3a). The main differences in the rankings between experts and farmers were related to risks (Fig. 3b). For farmers, the highest perceived risks were a failure in crop production and social vulnerability (lack of access to health and educational services). Experts, in contrast, perceived insecurity (theft of products from plots or during transportation) and the unreliable weather to be the highest risks for farmers. From a gender perspective, results showed that women and men disagreed in rankings with experts for few themes. Whereas women agreed with experts that insufficient planning is a major risk (even ranking it higher than experts), men agreed with experts that insecurity is a high risk (for women, this was among the lowest risks). The risk rankings showed clearly that farmers see the symptoms of social inequality (first rank of social vulnerability), agricultural production, and market risks such as unstable prices or production failure. Farmers ranked insufficient planning lower and unreliable weather very low compared to experts. These results showed that experts rather ranked risks from climate higher than farmers did. Experts would rather expect a higher planning activity of the farmers for adaptation to climate risks. Contrastingly, farmers believed that they were doing already as much as they could. Experts and farmers also ranked barriers to adaptation differently (Fig. 3c). Experts perceived both external factors such as the national policy and internal factors such as the adaptive capacity of farmers to be the main barriers for deciding to take action and to adapt to change. Farmers, in contrast, ranked the lack of information about weather and climate, especially seasonal weather forecasts, as their main barrier to act by adapting to change. Farmers with age above 50 ranked not acting collectively the highest among the barriers for adaptation. The ranking of barriers showed that especially younger farmers felt financially unable (they ranked adaptation is too expensive high) to adapt to production risks from climate change (Fig. 4c). The fact that they ranked adaptive capacity low as barrier showed that they felt prepared to adapt to change but missed access to reliable weather information for planning (ranked high as a barrier). The experts rather saw the necessity for more activity in adaptation (high ranking of adaptive capacity as a barrier) and the rigid national policies impeding farmers’ adaptation. Experts did not share farmers’ perception about the relevance of improved weather information. The agreement between experts and farmers was mostly on farmers’ motivations (enablers to adaptation), which were family interests, increased quality of life, and traditional attachment to land (Fig. 3d). Regarding the motivations, one expert mentioned during the interview that: “Farmers in Cauca do have a strong connection to their roots. Territories and family unity are very important” (expert’s interview, translated from Spanish, Colombia, August 2014). Within these motivations, however, men and women placed different emphases. While women ranked food security and traditional attachment to land higher than men, men ranked economic interests and improved quality of life higher than women. Cluster 1—Higher-educated women–dominated farmers that are attributing risks to external factors: farmers belonging to this group are worried about ending up in poverty and fear that they will not be supported by the government. They consider insufficient planning of their farming activities as well as a lack of access to social services (social vulnerability) as key risks for their future. In the view of this group, farmers are dependent on weather forecasts which they consider necessary to adapt to risks in agricultural production; they perceive that not cooperating as a community is a barrier for taking action. Their adaptive capacity could potentially be triggered if they perceived that the quality of life for them and their families would increase from implementing adaptation measures. The group of farmers in cluster 1 consists of 62.5% women and 37.5% men with an average age of 44 years; 50% of the farmers reached the primary education level only, and 38% have obtained a legal land title (50% have started a legal process). The average farm size is 4 ha. Cluster 2—Lower-educated production–focused farmers with the land title: farmers belonging to this group are worried about a lack of access to credit or money to adapt agricultural production to change, and they are concerned about the government policies for rural development. These farmers perceive production failure due to uncontrollable factors (pest and diseases, climate events) and volatile selling prices for their products as the highest risks. The main barrier to adapt to change is a combination of low adaptive capacity and missing support from institutions. Similar to the first group, production-focused farmers are motivated to adapt to changes if their own and their families’ quality of life would increase. The group of farmers in cluster 2 consists of 43% women and 57% men with an average age of 44 years; 64% of farmers reached the primary education level only, and 57% have obtained a legal land title (29% have started a legal process). The average farm size is 2 ha. Cluster 3—Vulnerable, less-educated farmers with lower access to land: farmers belonging to this group are worried about unstable markets for selling their products and the associated poverty risk. Compared to the others, their perceived risk is based not only on production but also on insecurity issues on their farms and during the transport of their products to the market. The main barriers for this group of farmers are high costs for implementing adaptation measures to cope with risks and the missing support from institutions. Members of this group share motivation for adapting to change due to being traditionally attached to their land and region. They want to improve the quality of life for themselves and their families. The group of farmers in cluster 3 consists of 47% women and 53% men with an average age of 46 years; 67% of farmers reached the primary education level only, and 27% have obtained a legal land title (47% have started a legal process). The average farm size is 2 ha. Cluster 4—Risk-aware male–dominated elderly farmers with the land title: farmers of this group are worried about the government, risks from climate change, and the overall security in their region. The risks perceived as the highest by these farmers are social vulnerability such as the lacking access to social services and the risks associated with regional insecurity. The main barriers to adaptation lack weather forecasts and a low adaptive capacity on their farms. Like cluster 3 farmers, they feel traditionally attached to their land and also believe that their land is highly suitable for agricultural activities. The group of farmers in cluster 4 consists of 38% women and 62% men with an average age of 57 years; 69% of farmers reached the primary education level only, and 62% have obtained a legal land title (38% have started a legal process). The average farm size is 3 ha. Detailed results of all comparisons, gender differences, and the hierarchical clustering of farmers’ rankings are presented in Online Resource 4. This paper presented an integrative approach to understanding how climate risks are integrated into the context of other risks in the farmers’ decision-making process. We compared the experts’ with the farmers’ view and differentiated between concerns, risks, and barriers for adaptation, and enablers to adaptation. Two explanations in the literature stress why this type of integrated analysis of farmers’ risk is more suitable than an isolated analysis of climate change risks: (i) farming systems of smallholders in the developing world are complex systems of location-specific characteristics integrating agricultural and nonagricultural livelihood strategies, which are vulnerable to a range of climate-related and other stressors (Morton 2007; Feola et al. 2015), and (ii) farmers’ long-term memory of climate events tends to decrease significantly after a few years; therefore, the importance of climate risks in farmers’ perceptions may equally decline very quickly after disturbing climate events (Brondizio and Moran 2008). In the case of Cauca, the interviews were conducted in 2014, a year with ENSO neutral conditions, the same as the two previous years. Farmers ranked climate risks low among their perceived risks in agricultural production, a perception that might change if the interviews would have taken place in a year affected by ENSO conditions (e.g., with a prolonged drought and high temperatures). Our findings showed that in Cauca, differences in experts’ and farmers’ perception and related farmers’ concerns, risks, and barriers and enablers for adaptation existed and could lead to miscommunication and, consequently, to a maladaptation to climate change. This was partly explained by the finding that experts agreed with farmers about main concerns for farmers but disagreed about risks and barriers for adaptation, thus suggesting that the same view on a problem might not necessarily lead to similar action propositions. Our study contributes to a growing literature on how perception influences farmers’ decision-making for adaptation and adaptation behavior. We especially analyze how climate risks relate to and interact with other risks and concerns in the farmers’ decision-making process. This is important because smallholder farmers in countries like Colombia are subject to multiple interdependent stressors and deeply rooted social vulnerability. This interdependency requires a systemic perspective in farmers’ risks. Some other studies simply compare meteorological data with people’s memories of historical climate events (Boissiere et al. 2013); they attempt to link farmers’ perceptions about climate change and related risks to adaptive behavior (Jacobi et al. 2013; Quiroga et al. 2014; Barrucand et al. 2016). Our integrated view on farmers’ perceptions and decision-making might better capture the multitude of stressors for farmers and showed a lower perceived relevance of climate risks than other studies focusing on farmers’ perception of climate risks. Especially for countries like Colombia, where multiple stressors and rooted causes of social vulnerability act simultaneously on farmers’ decision-making, the adaptive capacity to climate risks is constraint (Reid and Vogel 2006; Feola et al. 2015). Our findings show that farmers see the symptoms of social inequality but not their low adaptive capacity to cope with risks from climate change. The farmers’ low ranking of insufficient planning and unpredictable weather as risk equally underlined their lack of perception of climate risks, which was not perceived in the same way by experts. Contrastingly, the experts rather looked first at climate risks and insecurity for transport, but instead did not perceive production failure, unstable prices, or roots of social vulnerability as high risks. 4.2 What can we learn about climate risk communication? While experts focus on communicating climate change risks, in cases such as we found in Cauca, farmers do not see such information as practical since their highest perceived risk is the poverty trap (social vulnerability) and the sum of risks related to the agricultural production of which climate risks are merely a part. In their article, Reid and Vogel (2006) pointed to this fact by stating that farmer’s associate crop losses sometimes with climate events which are, however, not always seen as extraordinary and farmers are accustomed to coping with them. This is also supported by our findings. Farmers in Cauca do not rank climate risks high among their perceived risks, but they rank the lack of weather forecast and weak institutional services as the most important barriers for adaptation to agricultural production risks. Differences between experts’ and farmers’ views related to the weather forecast, seasonal forecast, and climate change projections of long-term changes and inter-annual climate variability are relevant issues in climate risk communication (Weber 2010). In the case of Cauca, experts do not perceive that there is a lack of climate information for farmers. Thus, we recommend that experts should provide context-based–climate-related information in such a way that it becomes tangible and usable for farmers in their everyday and long-term decision-making, for example daily and seasonal weather information associated with agro-advisory services on varieties, planting dates, and water management. Our findings show that farmers in Colombia do not perceive climate risks separately; they are embedded in their mental models of agricultural livelihood risks. Other scholars have shown that in Colombia, climate change, trade liberalization, and violent conflicts act simultaneously on farmers’ livelihoods, but policies address them separately (Feola et al. 2015). If the implementation of policy actions is not coordinated, they might hinder each other or lead to failure. 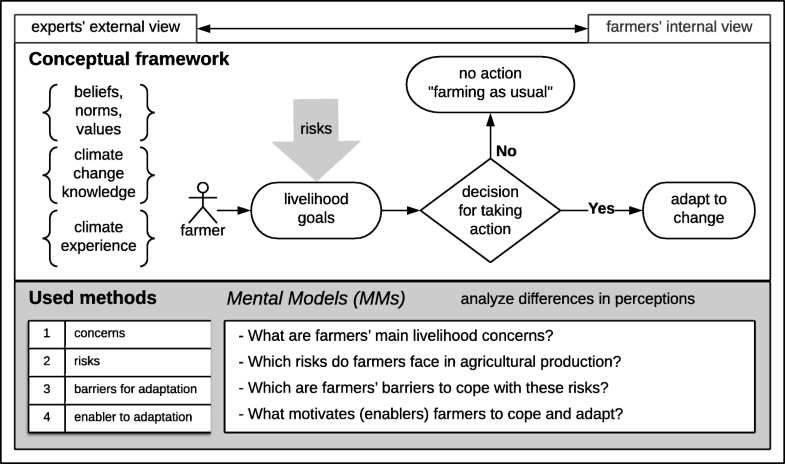 Understanding differences between experts’ and farmers’ mental models about risks is the first step to better design adequate policy actions for adaptation. Additionally, our results show that farmers in Cauca hardly trust national policies as mentioned by some experts as well as by farmers during the interviews. Farmers in Cauca are overall concerned about national policies. Llorente (2015) asserts that this is a result of the violent conflict which, in rural areas like Cauca, has led to profound mistrust in the state. Feola et al. (2015) argue that the institutional integration between different levels of government has been historically difficult in Colombia. Agricultural policies are often not based on the realities of smallholders. However, before designing adaptation strategies for farmers, the deeply rooted social vulnerability and inequality must be addressed and brought to the focus of experts. Ideally, this should be done together with farmers as a social learning process. “Adaptation is a dynamic social process” (Adger 2003, p. 387), including many different actors. We agree with Vogel and Henstra (2015) to involve local actors in the development process of adaptation plans instead of operationalizing top-down adaptation measures. We suggest starting this process by developing a Local Adaptation Plan of Action (LAPA) in Cauca, aiming at initiating a bottom-up process of adaptation planning, which takes into account the community and individual levels (Jones and Boyd 2011; Regmi et al. 2014). The uptake of adaptation strategies depends on barriers and the adaptive capacity of both the community and the individual farmer. 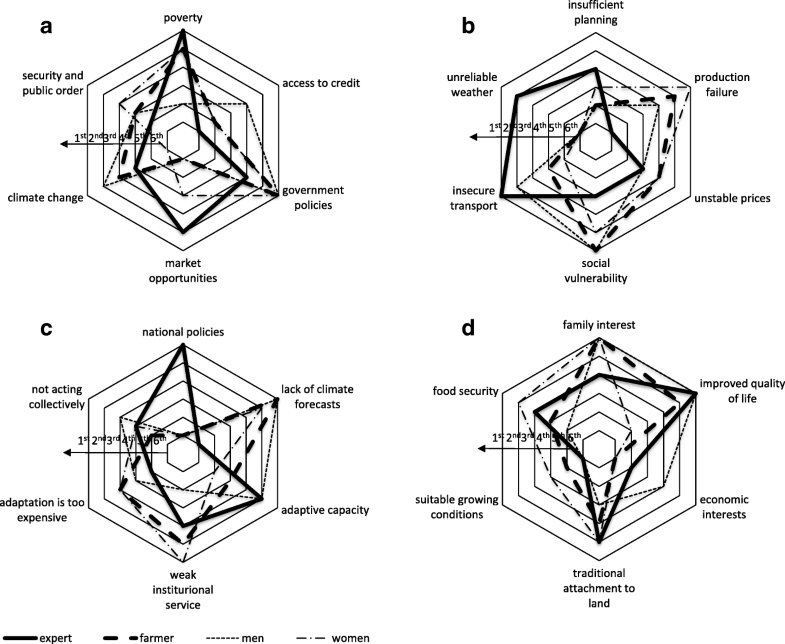 Effective adaptation at the community level would require a mix of top-down structural measures, often provided by institutions, including national adaptation plans, financial services, economic incentives, and nonstructural measures developed by the community itself as a collective action (Girard et al. 2015). Finally, transformative adaptation instead of targeting climate change by individual technological solutions would be a better approach for Colombian smallholders because it focuses on the root of vulnerability rather than on the adaptation of production systems only (Feola 2013). Such an approach would bring a more central role to farmers in developing adaptation options together with experts and would stimulate a social learning process in which science engages with lay knowledge and contributes with its transformative role to society (Feola 2013; Mauser et al. 2013). Climate change in the context of Latin America is characterized by complex lay and expert knowledge systems, social coping mechanisms, and ancient resilience mechanisms to adapt to perturbations (Sietz and Feola 2016). Several scholars support the need for an integrated approach to address critical dynamics of vulnerabilities and constraints for adaptation around climate change more integrated into cultural and socioeconomic realities (De los Ríos Cardona and Almeida 2011; Ulloa 2011). Other authors call for identification of causes of vulnerability and transformative solutions to cope with risks from climate change (Ribot 2014). Anyway, the state and its institutions are also important to provide a policy framework for adaptation, to intervene when resources are required, and to enable needed policies (Ramirez-Villegas and Khoury 2013). Finally, cooperatives could play a crucial role and become vehicles for rural development, opposite to previous top-down approaches that have failed in Colombia (Gutiérrez 2014). For further research, we recommend to study the dynamics in the farmers’ complex livelihood system, to analyze the actor’s network of farmers, and to identify adaptation pathways for farmers to cope with climate change in Cauca, Colombia. Since the 2015 Paris Agreement (COP 21), the political commitment to take action on climate change increased. Even in developing countries, policymakers have started working more specifically towards policies for achieving climate resilience, especially in the agricultural sector. Agriculture, both contributing to climate change and being affected by climate change, needs a transformation to become more sustainable and climate resilient by improving farmers’ livelihood system and farm productivity while reducing emissions from agriculture. Especially, transforming smallholders’ agriculture in developing countries such as Colombia requires greater attention to human livelihoods and related concerns, risks, barriers to decision-making, and the adoption of adaptation strategies. This study applied a mental model approach to understand better climate risks in the context of farmers’ decision-making process. It showed that climate risks need to be seen in the overall context of farmers’ livelihood risks. Climate change adaptation strategies and policies can be more successful if they (i) address specific climate risks, (ii) simultaneously address other risks of major importance for farmers, and (iii) target more climate risk–sensitive groups of farmers. Our research demonstrates that understanding differences in experts’ and farmers’ perception of farmers’ livelihood risks could avoid maladaptation and improve climate risk communication from experts to farmers. Therefore, we recommend to study the dynamics in the farmers’ complex livelihood system, to analyze the actor’s network of farmers, and to identify adaptation pathways for farmers to cope with climate change in Cauca, Colombia. This work was implemented as part of the CGIAR Research Program on Climate Change, Agriculture and Food Security (CCAFS), which is carried out with support from the CGIAR Fund Donors and through bilateral funding agreements. For details, please visit https://ccafs.cgiar.org/donors. The views expressed in this document cannot be taken to reflect the official opinions of these organizations. We thank the International Center for Tropical Agriculture (CIAT) and Fundacion Ecohabitats for supporting the fieldwork.